Having reviewed the supply and demand for real estate in Tallahassee almost every day for more than 6 years, it is not too difficult to provide an accurate Tallahassee housing forecast. But several years ago, just to ensure that I was not missing something, I began to study the Tampa housing market too, with the idea that I would perhaps learn something from how the two markets compared and/or contrasted. And I have. In the real estate graph above, the yellow band represents "market equilibrium" for Tallahassee. Currently, every price range is still working through a difficult buyers market. Because of this, my Tallahassee housing forecast continues to call for falling values, as there are far more sellers than buyers in Tallahassee. But contrast that with the graph above, showing a split market in Tampa. Homes that are priced below $180,000 are clearly in a seller's market, with less than four months of supply available. But homes priced above $350,000 are still in a buyers market, as Tampa (like Tallahassee) grossly over-built the upper end of its market during the days of easy loans at low interest rates. Now that people have to qualify under traditional standards, there are not nearly as many upper end home buyers. When people do a study on the overall Tampa housing market, they see what appears to be a buyers market. The relative supply of homes in Tampa is sitting at four months, and without drilling-down like we did above, you might think it is time to produce more homes. Unfortunately, Tampa will be seeing many of the higher price range homes drop their prices to fill in the demand at the lower price points. That is how a glutted market returns to equilibrium. In Tallahassee, we are obviously well behind the recovery that the Tampa housing market is enjoying. Tallahassee home sales are not yet on a rise, which Tampa began seeing near the end of 2008. 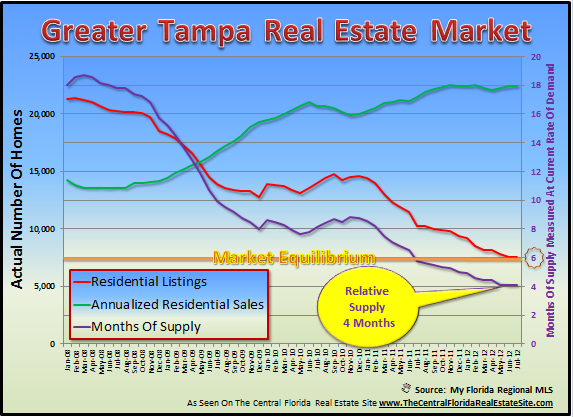 Does this mean we are four years behind Tampa in the real estate market recovery? How does the Tampa comparison effect my Tallahassee housing forecast? 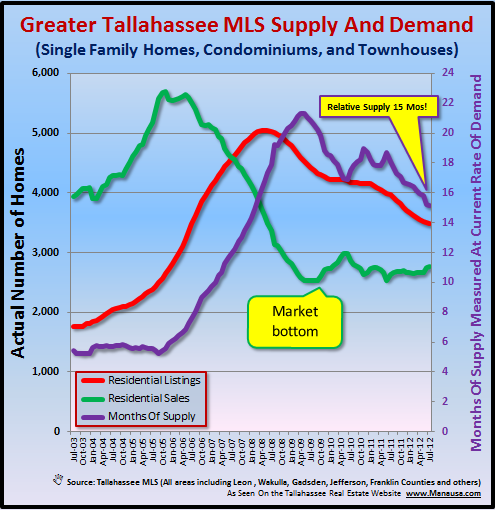 The answer lies in the real estate supply and demand dynamic in Tallahassee. 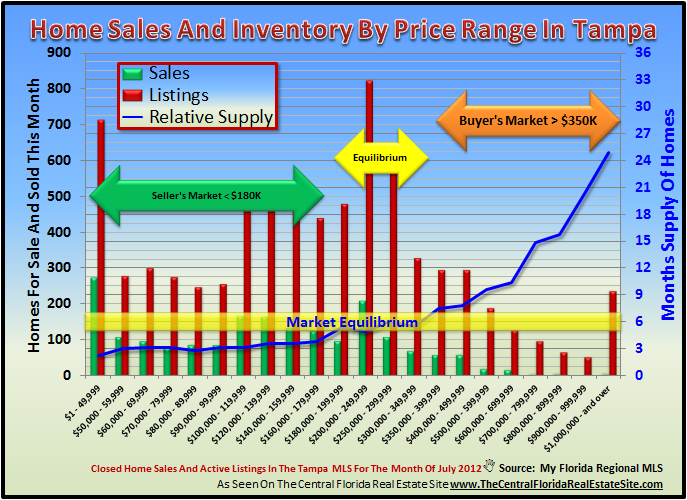 The Tampa market data only goes to reinforce what I have been reporting for more than 6 years. All we have to do is study supply and demand and the market changes will occur to us before they even happen. I do not see anything in the real estate graph above to indicate a return to market equilibrium in the next few years. Tallahassee home sales are flat, and we know that scores of foreclosures will soon be joining the supply side of our market. As my 2012 Tallahassee Housing Forecast from last year projected, I do expect the increased foreclosure inventory to draw more buyers to the market. I anticipate that Tallahassee will see the number of home sales rise, just like Tampa did beginning in 2008. I do believe the start of the housing market recovery is upon us, and I believe it is going to take five to ten more years for our market to get back in a normal rhythm. The next major move will be when Tallahassee enters a split market, with lower-end homes enjoying a sellers market, and upper end homes remaining in a buyers market. We will then be able to track the two sides as they join in the middle, much like Tampa is starting to see. If you have been thinking about moving and want to how this Tallahassee housing forecast affects you, just drop me a note and we can explore the benefits of moving now versus waiting a few years.